Steppin' Stones event: "Preparing for Change"
You are invited to Part 2: ‘Developing The Plan’. 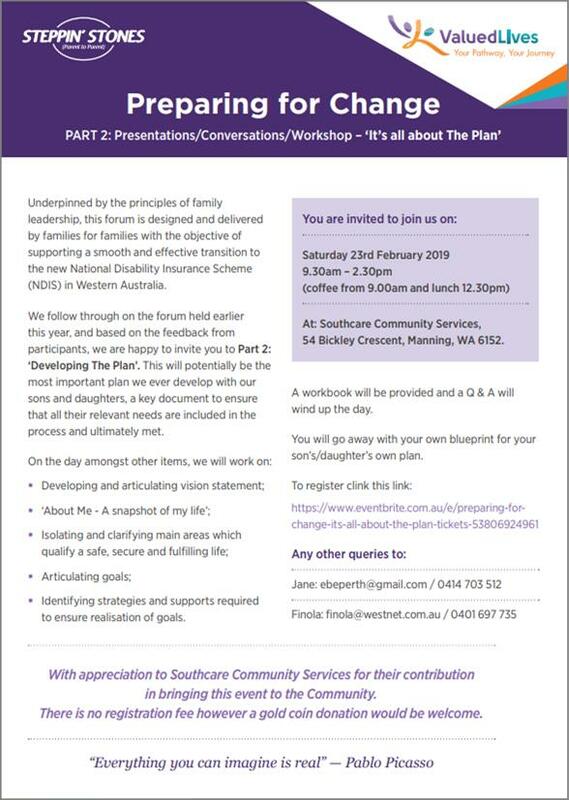 Underpinned by the principles of family leadership, this forum is designed and delivered by families for families with the objective of supporting a smooth and effective transition to the new National Disability Insurance Scheme (NDIS) in Western Australia. This forum follows through on the previous forum held in April 2018 together with the feedback from participants. Registration is free (gold coin donations are welcomed). Click on the image below to access the flyer with full details of this event.